The ancient sedimentary outcroppings that tower above the Grand River is the only place in the Lower Peninsula - other than climbing walls - where somebody can lace up a pair of rock shoes and dip their fingers into a chalk bag. That's on the north side, where at the City of Grand Ledges’ Oak Park climbers set ropes and tackle routes with names like Rocket Man and Second Thoughts. 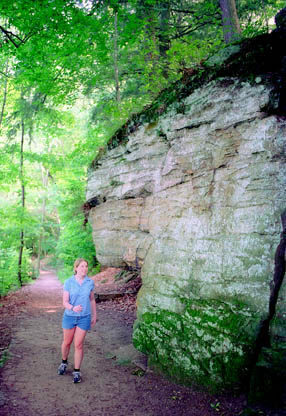 Hikers head to the south side where the mile-long Ledges Trail skirts the base of the cliffs, linking Fitzgerald County Park with Island Park. Except for the initial descent to the river, this point-to-point path is a level and easy stroll that provides both a close view of this unique geological formation and a good vantage point from which to watch those daredevil climbers across the river. This round-trip, 2-mile hike was made for kids, combining an easy walk past interesting scenery with a chance of seeing rock climbers in action. The first third of the trail lies in the county park and has been developed as interpretive path with a corresponding brochure that can be downloaded from this site. 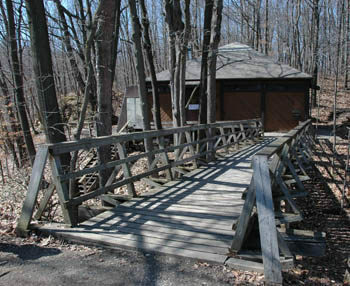 The trailhead for the Ledges Trail is just east of the large red barn that serves as the home to the Spotlight Theater. 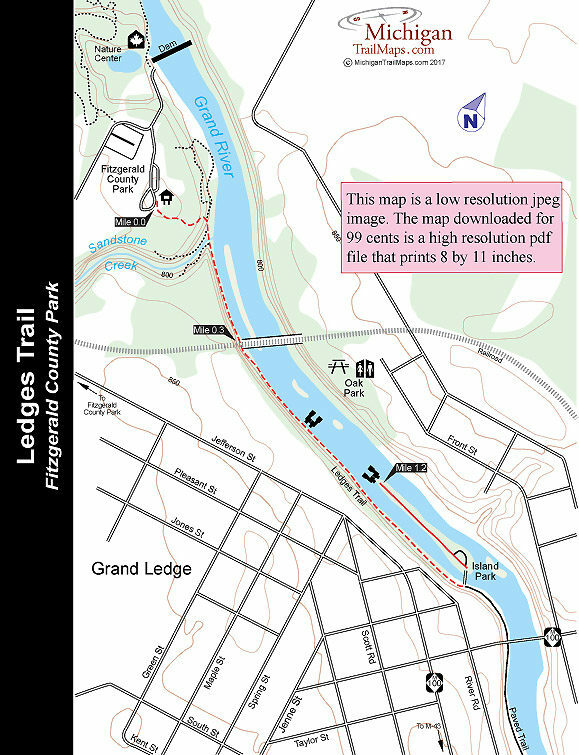 The trail immediately descends to the Grand River via a long stairway and crosses a bridge over Sandstone Creek to reach the first set of ledges on the other side. The impressive rock cliffs were formed 270 million years ago when most of Michigan was covered by water that carried and deposited sediments (sand, silt, and clay) in layers along river banks and beaches. After time and pressure compacted the layers into rock, the Grand River sculptured the cliffs through years of erosion. On both sides of Sand Creek are several short side trails; River Bottom and Baneberry Trails on the west side, Sandstone Creek Trail on the east. The Ledges Trail continues east skirting the Grand River and within 0.3 miles passes underneath a 19th century railroad trestle and leaves the Eaton County park. The remainder of the trail crosses private property but only a couple of houses pop into view above you. Most of the time you are secluded among hemlock pines with the Grand River on one side of you and the sandstone cliffs on the other. Within a half mile you reach the spot where its possible to see the steepest ledges in the area on the north bank of the river. These 70-feet-tall cliffs is where rock climbers congregate. A pair of binoculars will assist in watching the climbers though by June the heavy foliage on both sides of the river blocks a good portion of the view. The trail ends at the bridge to Island Park, a long, narrow island in the middle of the Grand River with benches, picnic tables and small docks along the shoreline. It's an ideal spot to enjoy an extended break before beginning the return to Fitzgerald Park. If there are climbers on the Ledges, you can also watch them in Oak Park on the north side of the Grand River, reached from M-100 by heading west on Front Street. For more on rock climbing at Grand Ledge check the website Grand Ledge Climbing (grandledgeclimbing.com). Fitzgerald County Park is open year round from 8 a.m. to dusk. A motor vehicle entry fee is required from April through October.